The ways that capitalism uses technology as a means of control was discussed on Thursday evening in London, at a meeting organised by the Breaking the Frame collective. The meeting was called “Interrogating Digital Capitalism”. Ursula Huws, who researches technology and labour at the University of Hertfordshire, started her talk by arguing that terms such as “digital capitalism” and “biocapitalism” are unhelpful. “I prefer to talk about capitalism”, she said. Capitalism uses technology at each stage of its restructuring, after recurrent crises, Huws argued. She pointed to three main ways that it uses technology for social control. ■ Technology is used to “simplify and standardise work processes” and sometimes – but not always – to substitute for labour. ■ Technologies are used to control work processes, and for surveillance. ■ Technologies are used to “create new commodities, bringing new areas of human activity into alienated, commodified relationships”. This included the “formalisation of the information economy” and the “commodification of domestic labour”. Huws talked about the role of internet-based employment platforms in the “gig” economy. With her colleague Simon Joyce, she last year published research suggesting that up to 5 million people in the UK have been pulled into the “gig economy”. Huws argued at the meeting that those hired via sites such as Freelancer, Upwork or Clickworker – often to do work conducted in isolated settings such as window cleaning or other domestic tasks – will find it harder to organise collectively than the Uber drivers. who have played a front-line role in worker organisation of precarious workers. Richard argued that cybernetics is “a systemic, structural and secular response to the issue of maintaining stable forms of accumulation and avoiding crisis inside capitalism”. (He has put notes from his talk on his blog.) He quoted Tiqqun’s assertion that cybernetics is “the tool by which capitalism has adjusted its capacity for disintegration and its quest after profit to one another”. 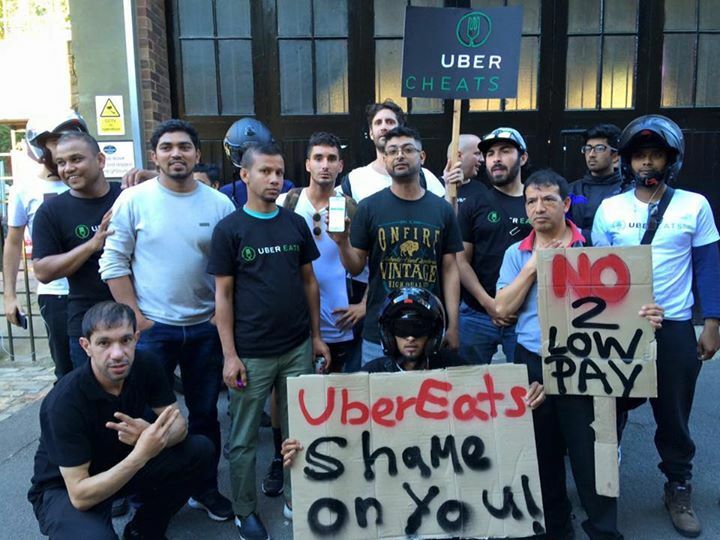 Uber Eats workers on a picket line, London, August 2016. Photo from the IWGB Couriers and Logistics branch web site. of technology needed to acknowledge not only the dangers inherent in its use by capitalism, but also its potentialities for socialism and for human development. “Cybernetics as the science of big systems began as a very noble endeavour”, he argued. It had been weaponised by power under capitalism, but could in future be employed differently. “It is very difficult to imagine technology other than as it really is now”, Hughes said – but we have to make that effort, as we imagine post-capitalist forms of society. Thursday’s meeting was the first of a series being organised by Breaking the Frame. This is a very useful initiative. In my view technology is a double-edged sword. We need an all-rounded understanding of it, which takes account both of the complicated way that it is used under capitalism for social control, and in the labour process (on which Ursula Huws’s talk focused), and of its potentialities, that should be integrated into our visions of post-capitalist society (as suggested in the discussion by Bob Hughes). GL, 10 July 2017. ■ Note for those who, like me, have not read up on cybernetics. It was defined in 1948 by one of its founders, Norbert Wiener, as “the scientific study of control and communication in the animal and the machine”. Wikipedia says that in the 21st century, the term is often used in a rather loose way to imply “control of any system using technology”. ■ About the picture. It shows workers for Uber Eats in London, during industrial action organised by the couriers and logistics branch of the Independent Workers Union of Great Britain, a grass-roots union outside the official TUC-affiliated structures. There were a series of strikes at Uber, Deliveroo and other “gig economy” employers last year. One result was a series of largely successful legal challenges to these companies’ practice of treating precarious workers as self-employed. The photo shows a picket in defence of Imran Siddiqui, who was victimised by Uber for his part in this campaign. This entry was posted on Monday, July 10th, 2017 at 7:05 am and is filed under Crisis of capital, Science and technology. You can follow any responses to this entry through the RSS 2.0 feed. You can leave a response, or trackback from your own site.